Benjamin Netanyahu's is on course for a record fifth term as Israel's prime minister. Benny Gantz, his main rival in Tuesday's election, conceded defeat at a press conference in Tel Aviv on Wednesday. "We respect the decision of the people," said centrist Gantz, who had been running neck-and-neck with Netanyahu with 97% of the votes counted. Netanyahu is in a strong position to form a coalition government with the right-wing parties who are backing him. US President Donald Trump phoned Israeli Prime Minister Benjamin Netanyahu on Wednesday to congratulate him on his re-election. Netanyahu said he thanked his ally for "tremendous support for Israel." Netanyahu tweeted that Trump had called him from Air Force One. Earlier on Wednesday, Trump told reporters that Netanyahu's re-election after a national vote was a "good sign for peace". During the election campaign, Netanyahu highlighted his close relationship with Trump, who delighted Israelis and angered Palestinians by recognising Jerusalem as Israel's capital in 2017 and by moving the US Embassy to the holy city in May 2018. Two out of three exit polls saw Gantz taking more seats than Netanyahu's conservative Likud. A third exit poll predicted the two parties would be tied. 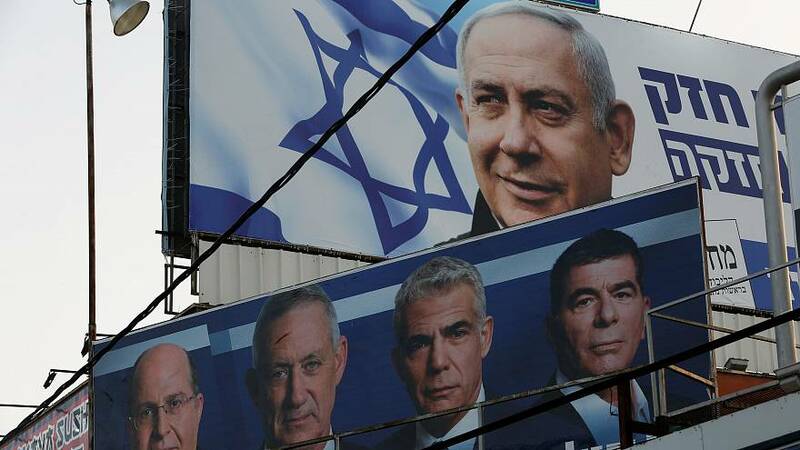 However, two of the polls predicted that right-wing parties would together take more than 60 of parliament's 120 seats, forming a bloc that Netanyahu could marshal to form the next coalition government -- a vital factor putting him on course to secure a record fifth term. "We won! The Israeli public has had its say!" said Gantz's centrist Blue and White party. "The rightist bloc led by Likud has won a clear victory," Netanyahu said. "I will begin forming a right-wing government with our natural partner this very night." His military reputation as a former paratrooper and chief of staff of the Israeli army is likely to reassure voters concerned with the country's security — an area where the right usually enjoys more trust. If he wins, Netanyahu will become the longest-serving Prime minister in Israel's 71-year history this summer. Netanyahu's strategy for this election has been to syphon votes from ultranationalist rivals, pushing his policies and rhetoric further to the right. On Sunday, he promised to annex Jewish settlements in the occupied West Bank should he win the election. While this strategy risks alienating moderate right-wing voters, Netanyahu can rely on the electoral system — no party has won a majority of seats since Israel's first election in 1949, so coalition-building will be essential. In Israeli politics, a "unity government" can never be ruled out if the path to a right- or centre-left-led coalition proves difficult — even though Gantz has pledged not to serve with Netanyahu. In the words of Haaretz, Israel's national newspaper, Netanyahu's long political career path is due to the fact that "Israelis are like smokers who would really like to quit, but who believe they can not function without their constant dose of nicotine." "On the ground what we see are various forms of de-facto annexation- not formally, not in terms of declaring it but what you see is over the last couple of years Israeli settlements are expanding through construction of neighbourhoods and infrastructure, even without establishing brand new settlements… What the right-wing parties are now saying is let’s put a name to this, let’s formalize it. I do see increasing pressure to extend Israeli law more formally and make declarations about annexation. It will probably begin in pieces, not the entire West Bank, we might see bills that were hovering in the previous Knesset, Bills such an annexing one settlement such as Area C which is 60% of the West Bank – I wouldn’t be surprised if we see those coming around in the next term. " "Netanyahu is a master of saying things that will help him win elections, even if they fall to the right of his actual governing policies. Sometimes his governing policies look a little more restrained... Even if Netanyahu himself would like to be more restrained than his campaign rhetoric, his coalition partners, may not allow it."